TNF inhibitors, or tumor necrosis factor inhibitors, are biologic drugs derived from human or animal tissues and are most commonly utilized to stop inflammation and disease progression by suppressing the inflammation-causing substance, i.e. tumor necrosis factor, in the body. It is primarily indicated for the treatment of various inflammatory conditions, which include rheumatoid arthritis, psoriasis, inflammatory bowel disease, and other inflammatory conditions. Currently approved TNF inhibitors that are utilized in the treatment of various inflammatory conditions include Adalimumab (Humira), Infliximab (Remicade), Certolizumab (Cimzia), etanercept (Enbrel), and Golimumab (Simponi, Simponi Aria). 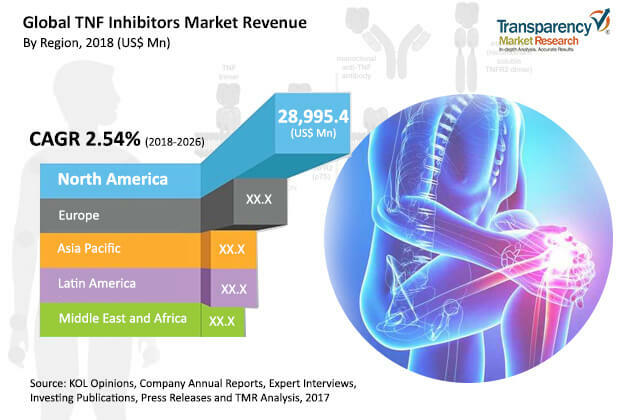 In terms of revenue, the global TNF inhibitors market was valued at US$ 40,369.9 Mn in 2017. It is expected to expand at a CAGR of 2.54% from 2018 to 2026. The global TNF inhibitors market can be segmented based on drug, application, distribution channel, and geography. Furthermore, in terms of drug, the market can be divided into adalimumab, certolizumab, etanercept, golimumab, and infliximab. The adalimumab segment is likely to account for a leading share of the global TNF inhibitors market, in terms of revenue, during the forecast period, owing to high clinical efficacy and its high preference by physicians in severe rheumatic disease. Patent expiry of major TNF inhibitors and entry of biosimilars are expected to increase the patient base and boost the adoption of TNF inhibitors during the forecast period. Based on end-user, the market can be segregated into hospital pharmacy, retail pharmacy and online pharmacy. The hospital pharmacy segment is estimated to expand at a significant growth rate during the forecast period, owing to the increasing number of hospitals and rising preference of the geriatric patient population to undergo treatment at hospitals. However, the online pharmacy segment is expected to expand at a high CAGR during the forecast period due to the increase in number of internet users and availability of TNF inhibitors at a lower price as compared to retail and hospital pharmacies. The overall TNF Inhibitors Market can be segmented based on drug, application, distribution channel, and geography. Furthermore, in terms of drug, the market can be divided into adalimumab, certolizumab, etanercept, golimumab, and infliximab. The adalimumab segment is likely to account for a leading share of the global TNF inhibitors market during the forecast period, owing to wide usage of adalimumab in moderate to severe disease conditions. Based on application the market can be classified into rheumatoid arthritis, psoriasis, inflammatory bowel disease, ankylosing spondylitis, and others. Based on distribution channel, the market can be segregated into hospital pharmacy, retail pharmacy, and online pharmacy. The market size and forecast for each of these segments have been provided for the period from 2017 to 2026, along with their respective CAGRs for the forecast period from 2018 to 2026, considering 2017 as the base year.